Cities: Capital: Sao Tome (Aqua Grande district). 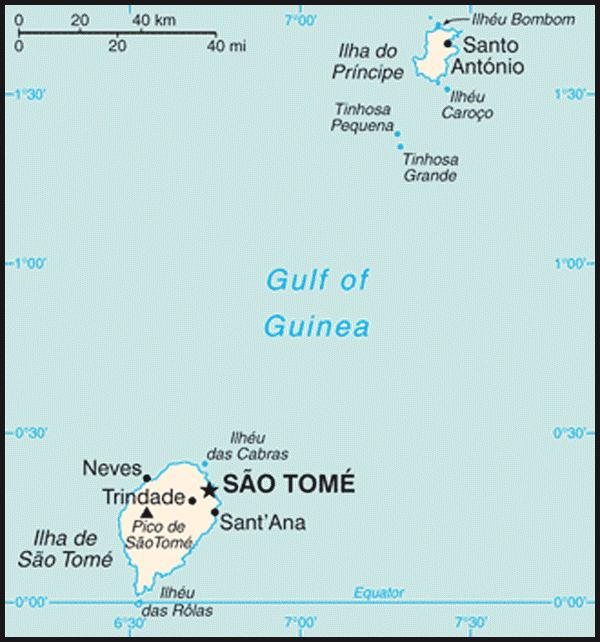 Other cities — Trindade, Santana, Angolares, Neves, Guadalupe in Sao Tome, and Santo Antonio in Principe. Terrain: Two small, volcanic islands plus associated smaller islands. Nationality: Noun and adjective — Sao Tomean(s). Education: Literacy (2009): 87.9%. Years compulsory — to secondary level. Health: Life expectancy (2009): 66 yrs. Infant mortality rate (2009 est.) — 37.12/1,000. Work force (by household, 2000 UN Development Program est. ): Agriculture — 15.3%; industry, commerce, services — 36.5%; government — 11.5%. Branches: Executive: president and prime minister. Legislative — National Assembly. Judicial — Supreme Court. Administrative subdivisions: Six districts, five on Sao Tome and one on Principe. Political parties: Movement for the Liberation of Sao Tome and Principe (MLSTP), Party of Democratic Convergence (PCD), Independent Democratic Action (ADI), Democratic Movement Force of Change (MDFM), Christian Democratic Front Party (FDC), Santomean Workers Party (PTS); Popular Party of Progress (PPP), National Union for Democracy and Progress (UNDP), and Democratic Coalition of the Opposition (CODO). Suffrage: Universal adult (18 years old). Agriculture (14% of GDP, 2009): Products — cocoa, coconuts, copra, palm kernels, cinnamon, pepper, coffee, bananas, beans, vanilla, poultry. Cultivated land — 484 sq. kilometers. Industry (15% of GDP, 2009): Types: light construction, shirts, soap, beer, fisheries, shrimp processing, palm oil. Trade: Exports (2009): $14 million (f.o.b. ): 95% cocoa, copra, palm kernels, coffee. Major markets — Portugal, Netherlands, Spain, Germany, China. Imports (2009) — $93 million (c.i.f. ): food, fuel, machinery and electrical equipment. Major suppliers — Portugal (43%), France (16%), U.K. (14%). At sea level, the climate is tropical — hot and humid with average yearly temperatures around 80 degrees Fahrenheit (27 degrees Celsius) and little daily variation. At the interior's higher altitudes, the average yearly temperature falls to 68 degrees Fahrenheit (20 degrees Celsius), and nights are generally cooler. Annual rainfall varies from 200 inches (500 centimeters) on the southwestern slopes to 40 inches (100 centimeters) in the northern lowlands. The rainy season runs from October to May. Roughly 160,000 people live on Sao Tome and about 6,000 on Principe. All are descended from various ethnic groups that have migrated to the islands since 1485. Six groups are identifiable:Mestico, or mixed-blood, descendants of African slaves brought to the islands during the early years of settlement from Benin, Gabon, and Congo and Europeans (these people also are known as filhos da terra or "sons of the land");Angolares, reputedly descendants of Angolan slaves who survived a 1540 shipwreck and now earn their livelihood fishing;Forros, descendants of freed slaves when slavery was abolished;Servicais, contract laborers from Angola, Mozambique, and Cape Verde, living temporarily on the islands;Tongas, children of servicais with forros born on the islands; andEuropeans, primarily Portuguese. In 1990, Sao Tome became one of the first African states to embrace democratic reform. Changes to the constitution, including the legalization of opposition political parties, led to nonviolent, free, and transparent elections in 1991. Miguel Trovoada, the country's first Prime Minister who had been in exile since 1986, returned as an independent candidate and was elected president. The Party of Democratic Convergence (PCD) beat the MLSTP to take a majority of seats in the National Assembly, with the MLSTP becoming an important and vocal minority party. Municipal elections followed in late 1992 in which the MLSTP came back to win a majority of seats on five of seven regional councils. The MLSTP followed this victory by winning a plurality of seats in the Assembly in early legislative elections held in October 1994. It regained an outright majority of seats in the November 1998 elections. Meanwhile, Trovoada formed his own party, the Independent Democratic Action Party (ADI), and was re-elected president in the second multiparty presidential election in 1996. The next presidential elections were held in July 2001. The candidate backed by the ADI, Fradique de Menezes, was elected in the first round. Parliamentary elections held in March 2002 led to a coalition government after no party gained a majority of seats. An attempted coup d'etat in July 2003 by a few members of the military and the Christian Democratic Front (mostly representative of former Sao Tomean volunteers from the apartheid-era Republic of South African Army) was reversed by international mediation without bloodshed. In September 2004, President Menezes dismissed the Prime Minister and appointed a new cabinet, a move which was accepted by the majority party. In June 2005, following public discontent with oil exploration licenses granted in the Joint Development Zone (JDZ) with Nigeria, the MLSTP, the majority party, and its coalition partners threatened to resign from government and force early parliamentary elections. After several days of negotiations, the President and the MLSTP agreed to form a new government and thus avoid early elections. The March 2006 legislative elections were held without problems. President Menezes' party, the Movement for the Democratic Force of Change (MDFM), in coalition with PCD, won 23 seats and took an unexpected lead ahead of the MLSTP. The MLSTP came in second with 20 seats, the ADI came in third with 11 seats, and the movement "Novo Rumo" gained one seat. On December 19, 2009 President Menezes was elected to lead the MDFM party. His election was challenged both within the party and by constitutional experts as unconstitutional. Constitutionalists argued that according to the country's semi-presidential constitution, the president could not exercise any other public or private function, including the post of party leader. The two coalition partners of the MDFM, MLSTP-PSD and PCD, criticized the election and announced an appeal to the constitutional court. In response to the MLSTP appeal, Menezes withdrew the three MDFM ministers from the coalition (Menezes directly controlled those particular ministers). However, two of the ministers, Justino Veiga and Cristina Dias, declared that they would continue in the government. This was impeded by Menezes, who vetoed Prime Minister Branco's (MLSTP) intention to keep the two ministers in a reshuffled cabinet. Unexpectedly, 2 days later, Menezes resigned the MDFM leadership, but denied that his decision had been influenced by any outside pressures. With export crops the focus of agricultural production, domestic food-crops are inadequate to meet local consumption, resulting in the need for food imports. Foreign donors are financing projects to expand food production, which now includes bananas, beans, cinnamon, and pepper. Cultivated land amounts to 484 sq. kilometers of the country's roughly 1,000 sq. kilometers, even though agriculture accounted for only 14% of GDP in 2009. The United States was among the first countries to accredit an ambassador to Sao Tome and Principe. The U.S. 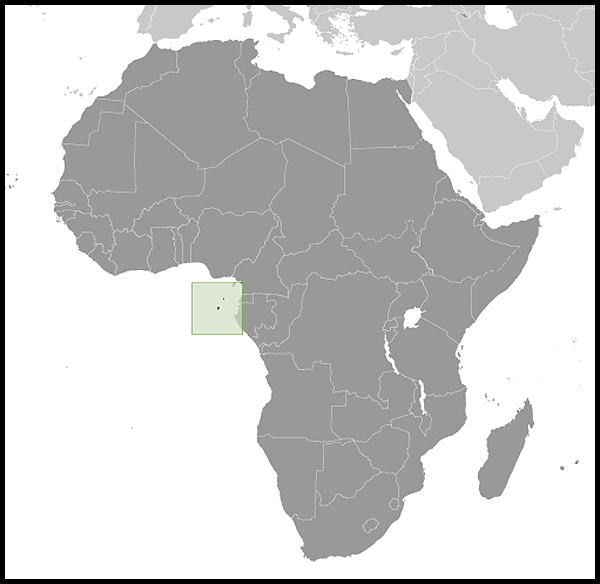 Ambassador based in Gabon is accredited to Sao Tome on a non-resident basis. The Ambassador and Embassy staff make regular visits to the islands. The first Sao Tomean Ambassador to the United States, resident in New York City, was accredited in 1985. In 1986, Sao Tomean President da Costa visited the United States and met with Vice President George H.W. Bush. U.S. relations with Sao Tome are excellent. In 1992, the Voice of America (VOA) and the Government of Sao Tome signed a long-term agreement for the establishment of a relay transmitter station in Sao Tome; VOA currently broadcasts to much of Africa from this facility. In 2007, the Millennium Challenge Corporation approved a threshold program which ended in 2011 to improve the capacity of the country's tax administration and customs enforcement agencies. Program successes include significant increases in tax revenues and the creation of a "One Stop Shop" for more efficient and cost effective business startup procedures. In recent years, the U.S. military and Sao Tome and Principe have conducted joint maritime exercises focused on securing the Gulf of Guinea. The U.S. Government also maintains a number of smaller assistance programs in Sao Tome, administered through nongovernmental organizations or the Embassy in Libreville. The U.S. Embassy (http://libreville.usembassy.gov/) accredited to Sao Tome and Principe is located on the Boulevard de la Mer, B.P. 4000, Libreville, Gabon (tel: 241-762-003; fax: 241-745-507).